Photograph depicts three newly installed B'nai B'rith members posing during the installation ceremony. 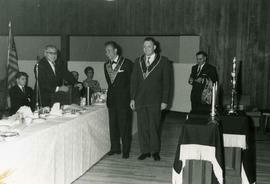 Photograph depicts two newly installed B'nai B'rith members posing during the installation ceremony. 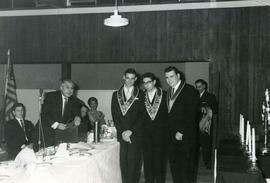 Photograph depicts (left to right) two unknown men, Sam Shamash, and David Walters holding a large trophy at an unidentified brotherhood event. Photograph depicts an unidentified man presenting an award to Chava Wosk .Written on verso: Sept. 79. Oct. 4/79.